After winning last year’s CCAA National Championship race and then going on to represent Canada in the 2011 World Junior Cross Country Championships in Spain, GPRC’s 2011-12 Female Athlete of the Year co-winner Fiona Benson has decided to move on to the next level. The 19 year old Dawson Creek athlete has accepted a generous scholarship offer from Trinity Western University in Langley, BC. Building on a solid rookie season in the ACAC/CCAA, Benson will be striving to become one of the top runners in the CIS. While it’s never easy to replace a national champion, the 2011 edition of the Wolves will start with a good mix of returning runners and talented newcomers. Both the men and the women will be looking to improve on their rankings from last year – the men 4th provincially and 7th nationally, and the women 5th in the ACAC and 9th in the CCAA. This year’s Wolves return five female athletes including: second-year runner Jackie Benning, third year athlete Vanessa Besharah, fourth year’s Linnea Saltel and Mandy Matier, and GPRC’s first-ever official fifth year runner, Carina Ness. Joining this quintet are about a dozen newcomers, making the Wolves women one of the largest teams in the entire CCAA. Three rookies to watch include Fort St John’s Kayla Hardy, Dawson Creek’s Lena Farrow and Grande Prairie’s Amanda Patteson. The men return ACAC all conference runner Devin Woodland for his second season. Woodland will be joined by second year runner Eric Martinek and third year athlete Evan Paul. Three newcomers from Dawson Creek’s South Peace Secondary School join the retuning trio. Jack Carrigan, Duncan Farrow, and Torleif Landsgaard will provide the necessary depth needed to compete in the very tough ACAC mens conference. The Wolves open their season on September 10 by hosting the Steve Burgess Memorial at the Wapiti Nordic Trails The team is also slated to run in ACAC races in Vermilion (Sept 17), Calgary (Oct 1), and Camrose (Oct. 15). 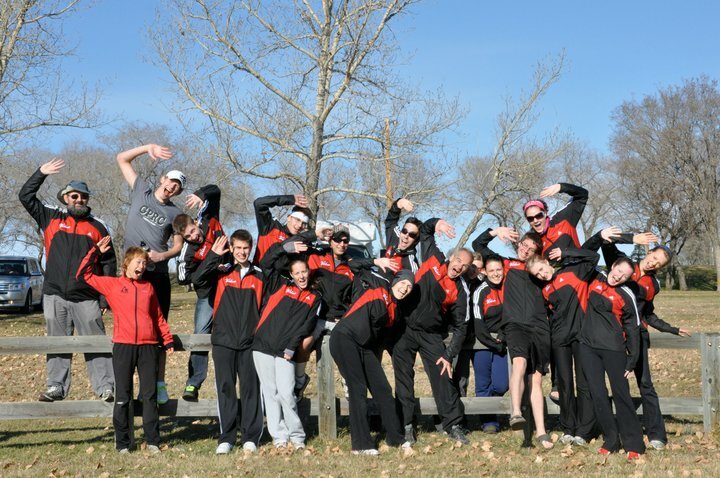 When not on the road, the team will host and compete in a number of Wolves Cross Country Running Series events in Grande Prairie and other Peace Country venues. Kamloops, BC participating in this year’s CCAA National Championships. The coaching duo of Rick Scott and Bill Corcoran are back to guide the team. 2010 marks Corcoran’s 21st year with the Wolves, while Scott enters his 20th year with the team. This entry was posted in Cross Country, Uncategorized and tagged Cross Country Running, GPRC Wolves X-C Running, Grande Prairie Alberta, Peace River Country, Running, Trinity Western University. Bookmark the permalink.